The WNBA announced a partnership with AT&T. It is the first non-apparel partner to have its logo featured on the jerseys of all 12 teams. But the logo won’t be featured on uniforms until 2020. The idea behind the rebrand is to connect with a new generation of fans……. Aces GM Dan Pandover relishes his role ahead of the WNBA draft. 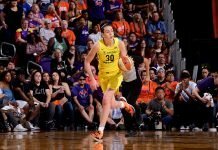 China’s Han Xu is unsure about the WNBA draft because of her nation’s workforce responsibility. Rebekkah Brunson’s vegan food diary. Reaction to the game is that it was a battle for the ages and a win for Lauren Cox. Chloe Jackson made sure no obstacle stood in her way. The Bears’ hard-fought season got them the title they deserve. Notre Dame’s seniors left a legacy. Sights and sounds from the game. Viewership on ESPN was up 11 percent from last year. Notre Dame’s Jackie Young will forego her final year of eligibility to enter the WNBA draft. Lauren Cox sprained her MCL and sustained a bone bruise and won’t require surgery. Thank goodness! Rumors have it that Kellie Jolly Harper will be the next Lady Vols coach. Buffalo coach Felisha Legette-Jack is considering other jobs. Angel Elderkin has signed a four-year contract extension with Appalachian State.